Apologies up front for missing this clip. We’re a little late. Our bad. The video is from a Clips-Bobcats game from this past Saturday. Bobcats games are largely embargoed where I live, on the off-chance impressionable youths see it and develop a deep, flammable hatred for basketball. Watching this clip of Corey Maggette quite clearly forget which team he is on, you can see why such protective measures are in place. OK, so they are definitely going to make a Will Ferrell movie about that pass. That pass is a Will Ferrell movie. In case you have watched this video and are worried that you are having a mescaline trip, I will explain it: Corey Maggette, of the Bobcats, brings the ball up the court, looks into the post and passes DIRECTLY to Caron Butler, who is on the Clippers. Corey Maggette was on the Clippers from 2000 to 2007. 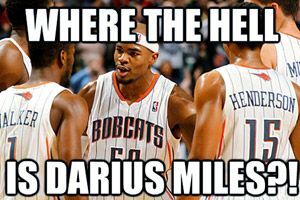 But he never played with Caron Butler. Also? They are wearing different uniforms. That’s always like a super-clear indication that you should NOT pass to a guy. The best part of all this? According to the Washington Post‘s Michael Lee, when Maggette passed Butler the ball, he actually yelled, “Shoot it!” And Butler even considered it! That’s how stupid it was! It made Caron Butler temporarily insane! The Clippers won, 111-86. Watch this video, and if you care about your children, don’t let them watch the Bobcats.